The gains were small but enough to pull the Dow, S&P 500 and Nasdaq to new records on Wednesday, Nov. 8, a year after the 2016 presidential election. The gains were small, but enough to pull the Dow, S&P 500 and Nasdaq to new records exactly a year since the U.S. presidential election. The S&P 500 added 0.14%, the Dow rose 0.03% and the Nasdaq jumped 0.32% on Wednesday, Nov. 8, all ending at all-time closing highs. The Dow closed at a record for a fifth day in a row. Wednesday marks a year since President Donald Trump won the electoral college, but not the popular vote, ending one of the most divisive presidential campaigns in U.S. history. Since then, the Dow has gained nearly 29% in its best post-election one-year gain since Franklin D. Roosevelt won his fourth term in 1945. Roosevelt's vice president,Harry S. Truman, assumed the presidency when Roosevelt died early in 1945. Former President Barack Obama saw a 1.8% gain in the Dow during the first year of his presidency. At that point, the economy was still in the grips of the Great Recession. However, that gain surged to a nearly 19% increase in the first year after his second win. "Markets have had an impressive performance, and the path has been very smooth," Tim Courtney, chief investment officer at Exencial Wealth Advisors, told TheStreet. "The last year has had two distinct phases. The first from November until about March 2017 saw some of the companies that hadn't been performing so well, such as small and value-priced companies, doing extremely well with great outperformance. However, since March, these companies haven't moved much and instead it has been the larger and more grow-oriented companies, particularly tech, that have picked back up and greatly outperformed." Trading was erratic on Wednesday as investors awaited clarity on the GOP's tax plans. Senate Republicans expect to release their take on tax reform on Thursday, Nov. 9, a week after the House GOP released its Tax Cuts and Jobs Act. Senate Finance Committee Chairman Orrin Hatch is scheduled to reveal details of the Senate bill at that time. Senate Majority Leader Mitch McConnell said his chamber aims to debate the bill next week, while the House could pass its version around the same time. President Trump's White House has pushed for tax cuts to pass by the end of the year. If that happens, it will be the first piece of major legislation since he assumed office in January. "With the failure of health care and basically every other legislative initiative, [Republicans'] ability to govern is still very much in question," Brad McMillan, chief investment officer for Commonwealth Financial Network, wrote in a note. "A failure on tax reform, which seems close to the default assumption among many, would just give an answer of 'no' to that question. Taking that into the 2018 mid-terms would certainly raise the chances of losing the House and possibly the Senate." However, in what could cause a disappointment to investors, Senate Republicans could delay corporate tax cuts and alter other aspects of the tax reform bill supported by Trump. Legislators are reportedly exploring postponing the $845 billion corporate tax cut until 2019, according to The Washington post. At the same time, Republican senators were planning to eliminate the state and local tax deduction, going further than the House, which retained part of the popular tax break. It was a resounding victory for Democrats on Tuesday evening in elections in New York, New Jersey and Virginia. 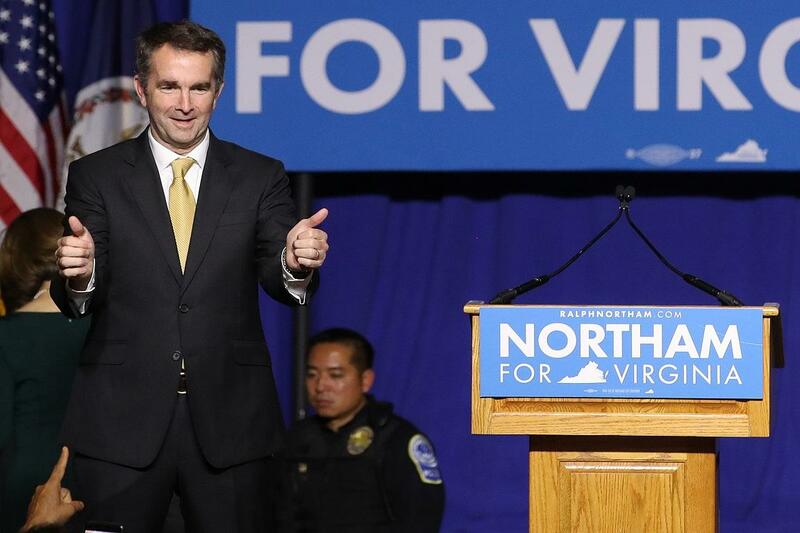 Democrat Ralph Northam beat Trump-backed Republican Ed Gillespie in the race for Virginia governor, while voters in New Jersey elected Democrat Philip Murphy, a former executive at Goldman Sachs, as their next governor. Northam's election was being viewed as a political setback to Donald Trump, who on Tuesday wrote on Twitter that "Ralph Northam will allow crime to be rampant in Virginia." But Trump also distanced himself from Gillespie, saying that Gillespie "did not embrace me or what I stand for." The Democratic mayors of New York and Boston, both vocal Trump critics, also easily won re-election. Also in Virginia, Danica Roem beat out incumbent Robert G. Marshall for a seat in the House of Delegates. Roem is one of the first openly transgender elected officials, while Marshall often championed anti-LGBTQ measures. Democrats Ralph Northam and Phil Murphy Win Governor Races in Virginia and N.J.
Crude oil prices swung higher by midday even after a surprise increase in domestic inventories in the past week. Stockpiles rose by 2.2 million barrels in the week ended Nov. 3, according to the Energy Information Administration. Analysts had expected a comparable decrease in crude supplies. The American Petroleum Institute reported a decline of around 1.6 million barrels in the past week. Prices had rallied at the beginning of the week with their best gains in nearly a year on Monday, Nov. 6, as political unrest in Saudi Arabia fueled hope that production cuts among some of the largest oil producers in the world could continue beyond early 2018. West Texas Intermediate crude was down by more than 1% earlier in the session but turned higher by 1% to $57.79 a barrel by midday. In earnings news, Snap Inc. (SNAP - Get Report) was down 14% after the company badly missed Wall Street's fiscal third-quarter expectations. The company reported a loss of $443.2 million, or 14 cents a share, on revenue of $207.9 million. Analysts were looking for a loss of $393.8 million, or 15 cents a share, on revenue of $235.5 million. The stock had risen in premarket trading after it was reported China's Tencent Holdings Ltd. (TCEHY had built a 10% stake in the struggling social media company. Humana Inc. (HUM - Get Report) topped earnings estimates over its third quarter and increased its forecasts for full-year adjusted profit. The health insurer earned an adjusted $3.39 a share over its third quarter, higher than a targeted $3.26. For fiscal 2017, Humana expects adjusted earnings of $11.60, higher than a previous forecast of $11.50. Take-Two Interactive Software Inc. (TTWO - Get Report) was 10% higher on solid guidance for holiday sales. The video-game publisher anticipates full-year revenue of $1.74 billion to $1.84 billion, up from a previous range of $1.65 billion to $1.75 billion. The release of its NBA 2K18 game and its Grand Theft Auto franchise should continue to drive sales through the holiday season. Time Warner Inc. (TWX fell 6.7% after AT&T Inc. (T - Get Report) chief financial officer John Stephens said the timing of a deal to purchase the media company was "now uncertain." Stephens said at the Wells Fargo Media & Telecom Conference in New York on Wednesday that discussions with the Department of Justice had complicated the timeline of the deal. The Financial Times reported on Wednesday that the DoJ was pushing for AT&T to sell cable network CNN for the deal's approval to be granted. Small gains pushed Apple Inc. (AAPL - Get Report) to become the first publicly traded U.S. company to surpass a $900 billion market cap. Apple shares were 0.82% higher at $176.24 a share, giving the iPhone maker a market capitalization of $904.87 billion. Apple is a holding in Jim Cramer's Action Alerts PLUS Charitable Trust Portfolio . Want to be alerted before Cramer buys or sells AAPL? Learn more now.